The beautiful Hilton Edinburgh Carlton was once a renowned Scottish department store called the Patrick Thomson. It first began in 1889, when an aspiring haberdasher by the name of Patrick William Thomson opened a small storefront near Edinburgh’s South Bridge. Naming the store after himself, he rapidly emerged as one of the city’s leading textile distributors. Capitalizing upon its burgeoning popularity, Thomson moved his operation into a stunning four-story structure next to the nearby North Bridge in the early 1900s. Here, the Patrick Thomson blossomed into one of the country’s preeminent shopping centers. By the middle of the century, the Patrick Thomson was a household name throughout Edinburgh. But the store fell on hard times when the famous British retailer, the House of Frasier, acquired the business. Opting to take it in a new direction, the House of Frasier renamed the Patrick Thomson during the 1970s. It was a widely unpopular decision. As such, the store closed shortly after the rebranding. Yet, enterprising hoteliers purchased the erstwhile department store in 1984, who subsequently transformed it into a glamourous hotel. The building is now jointly managed under a partnership consisting of Aramis Hospitality and Hilton Worldwide. Both companies strive to ensure that guests from all over the world experience the best in Scottish hospitality when staying at the Hilton Edinburgh Carlton. 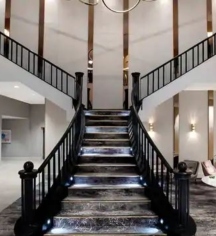 When the two thoroughly renovated the hotel, they placed an emphasis on restoring both the building’s historic elegance as well as its extravagant appeal. They refurbished every one of the Hilton Edinburgh Carlton’s 211 guestrooms and suites to provide the foremost in modern relaxation. Guests with physical disabilities even have access to specially designed rooms intended to enhance their level of comfort. In addition to refurbishing the hotel’s pristine accommodations, Aramis Hospitality and Hilton Worldwide launched the splendid Marco Pierre White Steakhouse & Grill. Inside, guests can feast upon the delicious cuisine of celebrity chef Marco Pierre White. Adjoining the restaurant is the tranquil Nineteen Hundred Bar & Lounge, which offers a fine selection of beers, wines, and spirits. With several large meeting venues onsite as well, the Hilton Edinburgh Carlton is great for hosting lavish events like business conferences, graduation parties, and extravagant weddings. Settled snugly in Edinburgh’s historic Old Town, the Hilton Edinburgh Carlton overlooks much of the inner city. Designated as a UNESCO World Heritage Site in 1995, Old Town and the neighboring New Town are replete with countless cultural destinations that epitomize Scotland’s amazing heritage. Within walking distance of the hotel resides numerous Scottish landmarks that have stood in the city for centuries, like the Edinburgh Castle and St. Giles’ Cathedral. Guests can also catch a rare glimpse into the daily lives of the British Royal Family by traveling to the Holyrood Palace just a mile away. More modern attractions surround the hotel as well, like the Camera Obscura and Dynamic Earth. Both locations feature spectacular exhibitions that can excite the imaginations of single adults and families alike. And the hotel’s proximity to the Royal Mile and Georges Street places guests at the epicenter of the city’s outstanding shopping districts. Hundreds of years’ worth of Scottish culture unfolds right before the doorsteps of the Hilton Edinburgh Carlton, granting guests a unique opportunity to experience the resplendent city of Edinburgh. Hilton Edinburgh Carlton, a member of Historic Hotels Worldwide since 2018, dates back to 1899. The building has always been closely connected to the local community. For instance, it used to be the site of a massive Christmas festival that began in 1955. To honor this special relationship, preservationists registered the location as a Grade B listed building during the 1970s. Cancellation Policy: Cancellation policies may vary depending on the rate or dates of your reservation. Please refer to your reservation confirmation to verify your cancellation policy. Early Check-In/Late Check-Out: £25.00 per hour up to maximum of 2.00pm - there after full nightly rate. Parking: Self-parking is available nearby for £17. Payment: American Express, MasterCard, Maestro / Switch, Visa are accepted. Rollaways: Available upon request; fees apply. The beautiful Hilton Edinburgh Carlton was once a renowned Scottish department store called the Patrick Thomson. It first began in 1889, when an aspiring haberdasher by the name of Patrick William Thomson opened a small storefront near Edinburgh’s South Bridge. 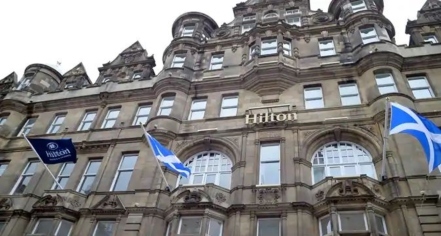 Learn more about the History of Hilton Edinburgh Carlton .